Just a week ago I was competing in last World cup in Munich. 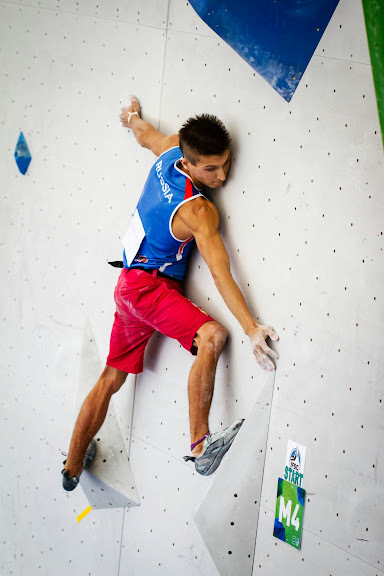 Today lets speak about the most important competition of this season, European championship bouldering. From the very beginning I should apologize because I disappointed many of you. Among others, my wife, my trainer and lots of Dutch funs expected the most from me. Here I’m at home. Before the start, I felt like a superstar and was thinking only about finals. To get into finals should not be difficult with these competitors. BUT. I forgot that this is a game and you should play honestly and emotionally. There is no place for predictions. We are fighting on the edge of our abilities; if you are calm you will never be able to do that. You have to be aggressive and furious. I choose wrong tactics… Everyone says sport is sport! I don’t agree with that. I made mistakes and I could avoid them, there is no chance here. I will not feed you with promises about future competitions. Now I need your support as never before. I love this sport! This entry was posted on 06.09.2013. It was filed under Climbing, Competitions.